Heavy work is any activity that activates your muscles and typically involves pushing, pulling, squeezing, carrying and lifting. Why is heavy work recommended? Heavy work activities stimulate the proprioceptive system – a system that provides us with a general map of our body and knowledge of where our body parts are in relation to one another. If you close your eyes and move your arms above your head and behind your back – this is the sense that tells you where your arms and hands are located without you looking. We use this sense everyday to do things like get dressed, walk down the street, carry books across the room, walk upstairs, eat and play. This sense also provides us with a grounded feeling in the world – a sense of safety, security and emotional well-being. Many of our sensory kids do not process proprioception in an accurate way. They may not register information from this system in the just right amount and need to get more proprioceptive input throughout their day in order to have a better understanding of their body and better emotional regulation. Still others may have difficulty processing proprioceptive information causing them to use too much force or too little force when completing tasks and interacting with others. Above all – heavy work is calming and organizing. It is often recommended before times where increased focus is needed, during times of high stress or anxiety and before bedtime. It is an integral part of sensory diets and a sensory lifestyle. Here are 10 ways to put heavy work into play. What better way is there to do “work” than through play! Play “pizza delivery”: Make pizzas out of playdoh – pushing, squeezing and cutting the playdoh -place the pizzas on top of books and have her carry books and pizzas to drop off to stuffed animals placed around the room. *If she can carry the books balanced on one hand (like a waitress) this will increase the input received as her muscles work harder. Have a pillow fight in your fort! Hide behind the forts and pop up to toss throw pillows at each other. The movements of jumping up and down to toss and duck out of the way provide nice proprioceptive input along with the throwing and catching of the pillows. Build ninja or warrior courses including climbing, crawling, jumping, and rolling and have her help you put it all together, then both of you race through or act as a team to get through. Race a timer to increase motivation and repeat performance. Animal rescue mission: Build a cushion and pillow mountain that he has to climb up to rescue a stuffed animal on top and then roll down the other side to bring the animal to safety. Play “wrecking ball” – you stand very still like a statue and have her push you over (resist falling for about 10-20 seconds). Here’s another rendition of this game: Build a tall tower of pillows or cushions. Pick your child up and have her swing forward and backwards to knock them down. Pretend play that you are animals and incorporate animal walks (bear walk, crab walk, etc.) into the game. Window washer or “teacher” – squirt water on the windows by squeezing a squirt bottle and wipe it down with paper towels by pushing from the bottom up and bending back down. This can be done on a chalkboard – being a teacher writing a lesson (you can even get spray chalk to double your squeezing experience!) and then squirt water and use paper towels to erase it. Remember play and time spent with caregivers are also calming and organizing experiences for kids. 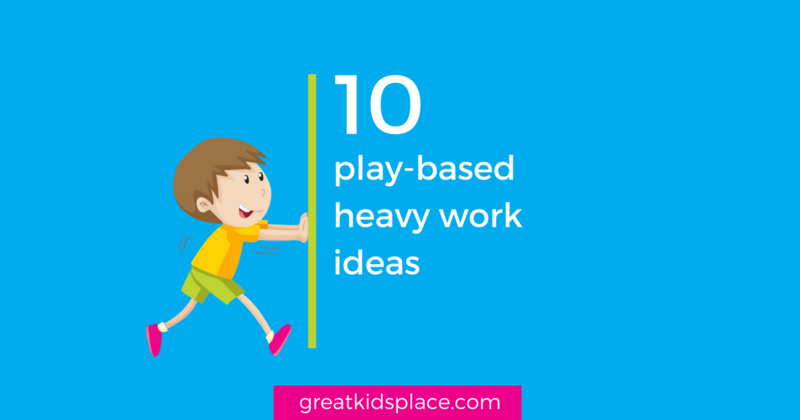 I wish you lots of fun and joy with these “heavy play” ideas!